You are currently browsing the Dublin Event Guide weblog archives for July, 2016. Bank holidays are always special treats and after a bank holiday-free July, we have another bank holiday Monday coming up this weekend. And while plenty of you are probably on holidays (This is the busiest weekend of the year at Dublin airport with more than 2500 flights taking off and landing.) there are some great events for everybody who is staying back to hold the fort. The Dublin Event Guide is currently published in two stages. The first stage is an update on the website and the smartphone app. More events will be added after that and the smartphone app will be updated continually. When all events are entered the second stage is to send the e-mail to all subscribers. This is the FINAL version of this week’s Dublin Event Guide (for Free Events). Update on the bills: After some more helpful donations last week, EUR 135 are needed in August to cover all the cost and with the month only starting, we are in a promising position. It would be sooo cool to get the money well before the end of the month. It worked in July, maybe it will work again with your help? Thanks so much to all supporters! If you can help in any way, your help will also be VERY much appreciated!!! Can YOU help here? For the last few weeks, I am quoting Tony Robbins here in the feel good slot. That has a number of reasons: 1) A free seminar about his courses will be in Dublin next Saturday and I plan to be there myself. 2) I have been at his main event “Unleash the Power Within” and it is an amazing event. So good that I am considering going to the one in London in May next year again. It is not free at all, but – in my opinion – very much worth the money. 3) He really and truly has some good quotes, so you could fill this Feel Good SLot just with Tony Robbins quotes for months. Last week Mona O’R, Helen B and Justin M were so great to help the Dublin Event Guide with a donation! Thanks a lot! I really appreciate your help! Please keep in mind that without donations there won’t be a Dublin Event Guide (for Free Events): Your donation will ensure that the Dublin Event Guide will continue arriving in your Inbox every week and every donation will benefit EVERY Dublin Event Guide reader! Roy K, Ross M, Ann HB, Susan F, Deirdre G, Mark C, John F, Melanie B, Mark G, Cory H, Avril C, Judy F, Jane O’H, Eamonn U, Gerard P, Fiona F, Yvonne O’S, Gabriel K, Roisin K, Mark C, Aislinn T, Barry P, Barbara D, Claire D, Barry M, Mateusz L, David K, Caroline O’C, Heather C, Joan S, David D, Sillybilly.ie, Elaine M D, Mark C, Shane W, Eddie R, Anne H, Comet Records, John F, Margaret W, Joan S, Nora O’K, David O’K, Tara R, Majella M, Trevor J, Noelle H, Keeva H, Geraldine H, Meav Ni M, Brendan M, Lilian R E, Jutta B-S, Brian H P, Elaine K, Emeline J, Melanie B, Eimear McG, Anita W, Peter W, Catherine G, Darragh J D, Arthur D, Martin O’S, Catherine E, Irene C, Ann M, Mark G, Bridget W, Scott P, Sean S, Paul McE, Patryk R, Melanie M, James R, Zelie McG, Nicole W, Dara MacD, Leslie C, Tania Z, James B, Siobhan M, Barbara Q-B, Eric C, Sueanne O’H, Patrick H, Kay G, Danny C, Clodagh O’C, Elizabeth M, Eibhin C, Sara B, Juliana AY, Pauline R, Eva M, Laura S, Sophie P-L, Seamus C, Christiane B, Aine G, Donna M, Siobhan P, Susan B, Sharon K, Michele McN, Elena W, Melissa C, Michael D, Tony B, Sandra Sch, Bill G, Catherine OS, Tim O’N, Geralidne G, Therese O’R, Pascale N, Louise F, Brendan M, Gareth G, Martina B, Deirdre C, Gennadii N, Rachael McC, Fiona D, Caroline M, Mark G, Colette T, Kathrin L, Ornaigh G, Krisztian V-D, Stephen L, Eamon S, Tom McI, Marsha S, Aishling B, Ana R T, Ciara M, John L, Nicola R, Mary O’N, Brendan O’B, Bruce F, Martin C, Roisin R, Olga F, Caoimhe NiM, Jessica G, David S, Debbie L, Lica B-B, Aodhagan D, Niamh S, Malachy B, Lorraine C, Stuart N, BCS, Filippo G, Kiera M, Lorna O’C, Elizabeth B, Patryk R, Rolando C, Aidan C, Ann M, Anita W, Ryan M, Clodagh O’C, Michele McN, Adam J, Marie C S, Colm D, Niamh D, Sean E, Belinda B, Cristina B, Pat M, Matija H, Rita B, JB M, Maria F, Endija S, Catriona D, Ailish B, Leigh P, George K, Miriam L, Mona O’R, Helen B, Justin M and Arthur’s Pub (www.arthurspub.ie A classic Dublin old-style pub in 28 Thomas Street with a new and buzzing music venue that runs lots of events), the Speedfriending Ireland Meet-up Group (www.meetup.com/Events-Drinks-Talks-Dublin/) (Where you can meet lots of new people and make friends), the Birdcage Bakery & Cafe (www.facebook.com/BirdcageBakery An independent cafe and bakery in 23 Harcourt Road, Dublin 2), Cycling Campaign (www.dublincycling.ie), www.FlamencoIndalo.com (A group that supports and promotes the art of Flamenco in Ireland), www.oliviercornetgallery.com (An Art Gallery in 5 Cavendish Row), www.thepaulkanegallery.com (A great Art Gallery, on the search for a new venue), www.cfcp.ie (The Centre for Creative Practices is the the only arts centre in Ireland dedicated to connecting, integrating and promoting immigrant, experimental and emerging artists among the local arts scene and audiences) and www.KravMagaIreland.com, the self-defence training centre for everyone, which provides regular 12-week or 2-day self-defence training courses for beginners. And if you forced me to decide, I would chose Atmosphere in Dun Laoghaire and maybe the Phoenix Park Fun Day. And again if I HAD to pick two, it would be the Dublin Flea Market and Hotter than July. During the week, the Free Wednesday is happening and on Thursday the Shakespeare plays in the Dublin Castle Gardens start. On Friday then the Rock ‘n’ Roll Festival starts. SpeedFriending is a new way to meet new people and to make long-lasting friendships and connections. It works like this: You get 5 minutes with each participant to see if you like them and if they are someone you would like to hang out with. Make new friends, expand your social circle and have an entertaining evening at SpeedFriending. Admission is EUR 10 and you can get your ticket at the door. Please RSVP on the website below. Dereck, the organiser of the meet-ups, has made 5 tickets available for Dublin Event Guide readers. If you want to win a ticket, send a mail to dublineventguide@gmail.com with the Subject SPEEDF08 and with your name and mobile phone number in the body of the mail. Your mail has to be with me by 13:00 on Wednesday 03 August. Did you know that the basement of City Hall is the home of a permanent exhibition called “The Story of the Capital” and also of a temporary exhibition about the Dublin Fire Brigade in 1916? The Story of the Capital exhibition is really good and I would recommend it strongly. There is normally an admission charge, but I found out a few days ago that in 2016 admission to that exhibition is completely free in connection with the Easter Rising commemorations. Put “The Story of the Capital” on your To Do list!! The exhibition is open from Monday until Saturday from 10:00-17:15. Due to Luas works, the North and South Quays are closed to eastbound and westbound traffic at O’Connell Bridge until 06:00 on Tuesday 02 Aug. Keep that in mind over the weekend. ESPECIALLY if you plan to use the car to get to Lansdowne Road/Aviva Stadium for the football match (Celtic vs Barcelona) on Saturday (Kick off is at 18:00), you should check the best route. The whole area around Ballsbridge will be congested and there are no car parking spaces really close to Lansdowne Road. The speed limits in Dublin City are being reviewed at the moment and a public consultation is running. Dublin City has the nonsensical plan to limit the speed in ALL areas of Dublin and on ALL streets to 30 km/h. In my opinion, it makes sense in areas of higher risk (near schools, playgrounds etc), but it doesn’t make sense as a general limit. Check out the details here www.dublincity.ie/speedreview and if you have ANY opinion, make it known. Do not rely on other people, YOU have to voice your concerns or opinions if you want them to be counted. Submissions can be made online until 17:00 on Wednesday 24 August 2016. We probably all have a number of apps on our phones and tablets that we don’t use very often (if at all). Don’t waste space with useless applications! Now is the time to have a clear out and make way for the best and most useful apps to hit the market this year. Eventbrite has compiled a list with 15 of the most interesting apps to be published so far in 2016, helping to give your productivity a boost and make your job (and your life) a little bit easier. A Ceremonial Military Guard will parade at the site of the “National Memorial to Members of the Defence Forces who died in the Service of the State”, at Merrion Square during July and August. Ceremonies will take place at the pyramid at Merrion Square opposite the back entrance to the Dail, every Saturday from 16 July to 20 August 2015. Units from different sections of the Defence Forces (Army, Air Corps and Naval Service) will participate in this Military Guard Ceremony to remember their comrades. Every week different units will be involved and the ceremony and the participating units are described on the website below. This ceremony normally takes place from 12:00-13:00, but this week (and this week only) it is already at 09:30. 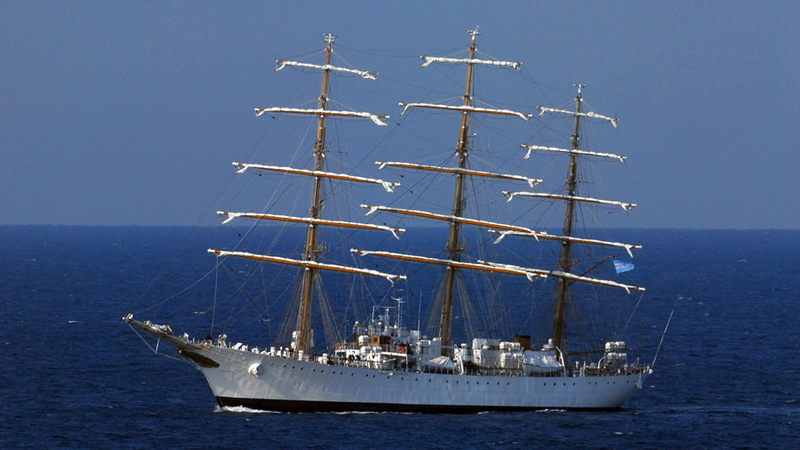 The Argentinian Navy Tall Ship “Libertad” is in Dublin at the moment and can be visited for free on Saturday from 10:00-18:00. The 100m long training ship is on a 196 day long voyage around the globe. On board are 24 officers, 187 crewmen, as well as 150 cadets and they came from the UK and will leave for Spain next. Before that, they alreaday visited the US, Brazil, the Netherlands and France. The ship was launched in 1956. Dublin City Hall has a museum/exhibition in the basement, called “The Story of the Capital”, it is an exhibition that you should definitely check out. Irish Record Fairs is bringing you their next CD, DVD and Vinyl market and it is the biggest one in the summer with 50 tables full of music. Vendors from Ireland and the UK will sell new and second hand discs and LPs and memorabilia. Admission is normally EUR 2 per day, but Brian from Irish Record Fairs made an exclusive offer for all Dublin Event Guide readers. 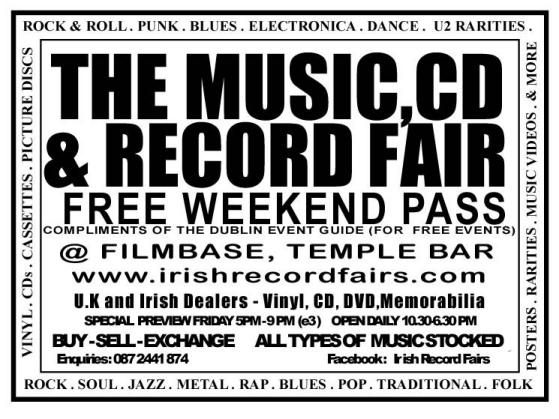 If you show this pass at the door www.dublineventguide.com/gif/IrishRecordFairs_DEG_Pass.jpg (printed or on you phone) you will get in for free on any of the days (Friday-Sunday). This Saturday, Emily will run a second walking tour from 14:00-16:00. Dublin Fire Brigade Historian and serving Firefighter/Paramedic Las Fallon is giving tours of Dublin Fire Brigade 1916 exhbition in City Hall Dublin every Saturday in July. Tours take place at 11:30, 13:00 and 15:00 and are suitable for all ages. A free Family drop-in workshop will take place on most days of the coming weekend and week for children aged 4-10. Find all the details on the website below. Are you interested in adopting a greyhound, then this is an ideal opportunity to meet a number of greyhounds which are available for adoption and to talk to owners and trainers to get a better understanding of the available greyhounds. It doesn’s state it explicitly, but I would expect or hope that admission is free. Ratha Yatra (or Chariot Festival) is a Hindu festival associated with Lord Jagannath. It is held at Puri in the state of Odisha, India. The Irish Hare Krishna community celebrates this festival every year and a procession and ceremony takes place this Saturday. The “Pahandhi Cermony” will commence the festivities at 11:00 at Merrion Square. At 11:30 a procession will leave for St. Stephen Green Park and a big chariot carrying the Deities of Lord Jagannatha will be pulled along the procession route. From 14:30 a free festival with Music, Dance, Drama, Mantra Singing and Vegetarian Feast takes place until 17:00. Everyone is invited to this colourful festival and you don’t have to worry even if the Hindu religion is not yours, you are still welcome. Furze Road is a road that leaves Chesterfield Avenue in Phoenix Park diagonally near where the Phoenix Park Visitor Centre is and Furze Road will be formally opened as a Commemorative Tree Avenue. To celebrate this, a Family Fun Day will take place on Saturday in Furze Road in Phoenix Park with music, farmer’s markets, aerial circus show, puppet magic show, face painting, picnic area and lots of fun for all the family. You heard about the Maser Billboard saysing “Repeal the 8th” that was painted on the wall of the Project Arts Centre in Temple Bar and that had to be removed (overpainted) by order of Dublin City. It was overpainted with Blue paint and that’s how “Project Blue” happened. Portrait photos will be taken with blue face paint for a protest against Dublin City’s order and against the 8th amendment. Atmosphere is a family-friendly festival by Dun Laoghaire Rathdown Events and it focuses on anything that has to do with Kites, Balloons and other flying things. A Drone Zone will feature experienced Drone pilots showing how to fly drones for racing, movie making and general home use. They will also offer demonstrations and simulations in operating drones safely. The Kite Flying Zone will feature stunt kites, free style kites and wacky kites. During the event, master kite flyers will demonstrate their skills and creations. Expert Kiters will give workshops on kite aerodynamics, design and skills. There will be kite flying competitions and a chance to make your own kite in the “make and do” area hosted by the experts in kiting. Bring your own kite if you have one, there will only be a limited supply available at the event. Professional balloon modellers will show off their skills by creating models of Movie Characters, Animals, Cartoon Characters and lots more. Each balloon artist will give a workshop on how to create a particular character at intervals throughout the day and then visitors can try their skills at balloon modelling in special make and do areas. There will be lots to do and see and you could walk away as a trained balloon modeller or kite maker. It’s a jungle out there and inside The Dead Zoo! Join this tour of the exhibition “Mammals of the World” and learn lots about jungle animals and their habitats. Admission is free and no booking required but places are limited. Suitable for Age 8+. Howth and Hop House 13 (a Guinness company) are bringing us the Howth Jazz & Blues Festival on the August Bank Holiday weekend from Friday 29 July until Sunday 31 July. 13 locations in Dublin 13 are taking part and there will be 17 gigs all together. While it is not explicitly stated, it seems that admission is free. The Sound House in Wiley Fox’s Pub is celebrating one of the beers they sell (Bru) with a Bru-Grass Festival. A Bluegrass Festival with the Dublin Bluegrass Collective and support “Huegrass”. The Rory Gallagher Tribute Band “Deuce” are playing a gig in the Harbour Bar. Sugar Dave will rock the Mezz with his gig from 21:00. The Solely Blues Club is an open mic night of only the old time blues numbers pre1960 (e.g. from Leadbelly, Skip James, Big Bill Broonzy, Bessie Smith, Odetta, WC Handy, Blind Wille Johnson etc) It is hosted by Slidin PK. Rock ‘n’ Roll Band “The Guilty Party” will play a gig in Whelan’s on Saturday. The “Fallen Lights” are supported by the “Men of Twenty” at this gig in Whelan’s. Admission is free before 22:30 or if you sign up for the guest list. The gig will start at midnight. Blues & Rock Trio Electroc Ape will play a gig in the Mezz from midnight. A Food & Craft Market will take place in the Farmyard at Farmleigh House and the St. George’s Brass Band will play in the Bandstand from 14:00-16:00. You will find our friends Paperbear.ie (amazing Pop-up cards) and Magpie’s Nest (Vintage Jewellery and Collectibles) at the Dublin Flea Market and if you have time, say HI from the Dublin Event Guide to them. ;-) I can recommend both strongly, great product and so nice to deal with! The event starts at 11:00 and includes a football match between Al Helal and Ballybrack, a bouncy castle, DJ, magician, Palestinian food and more. IT is not explicitly stated, but it seems that admission is free. The next Music Trail weekend will take place on Sun 31 July and Mon 01 August and the line-up and venues are listed below. Hotter Than July is a day long family-friendly multi-cultural music festival. It is running for the third time, but will be on Smithfield Square for the first time. In previous years it took place on Temple Bar Meeting House Square. Hotter than July is presented by the Improvised Music Company and Dublin City Council, in association with the Big Bang Festival of Rhythm and will be a celebration of music and dance from around the world. This is a family-friendly tour of the “Proclaiming a Republic: The 1916 Rising” exhibition, looking at some of the highlights of the Museum’s extensive Easter Week collection. Admission is free and no booking required, places allocated on a first-come first served basis 15 minutes before tour starts. Suitable for all ages. Hunter, The Dyatonics, The Fontaines. When the live music is finished, the Workman’s Karaoke Club and DJs will continue. Feel calm & relaxed and discover new technics to release stress in your daily life. A Zen Walk will help you to get the positive effects. The walk will last about 20-30 minutes and is suitable for everyone who simply wants to find calmness, relaxation and harmony in their busy lives. Trad & Folk band Bunoscionn are playing a gig in the Harbour Bar. Pete Pamf and teh Late Sunday Service will be in the Mezz for a gig on Sunday. NOT the first day of Autumn!!! It is an extremely stubborn myth in Ireland that Autumn starts on 01 August. Primary teachers were and are still (!!) teaching it, despite Met Eireann’s repeated attempts to correct this misinformation. It is true that the Celts started their “summer” on 01 May and therfore their Autumn on 01 August, but they lived by a completely different calendar: For the Celts the Dark half of the year started on 01 November and the light half started on 01 May. So strictly speaking the 01 May wasn’t even their start of summer, it was just the start of the light half of the year. In addition their day started at sunset! If, however, you have adjusted to a modern calendar – unlike your primary teacher!? – then the start of autumn is on 01 September as Met Eireann confirms to us. So, 31 more days of summer! Hurray!!! Just to make sure that you don’t go to work by accident, I want to remind you that Monday is a Bank Holiday (and Public Holiday). Nevertheless nearly all shops in the City Center and Shopping Centres are open and live just continues as if this was a second Sunday in the same week. For car drivers: Bus lanes are ACTIVE if it says that they are active on a Monday (even if the buses usually operate a weekend service on the bank holiday. Wheelchair parking spots are ALWAYS active, so NEVER park there. Free Ways (Bus lanes where parking is permitted at certain times of the day only) are ACTIVE! BUT, normal pay & display will not be enforced on a bank holiday. So, you can park in a Pay&Display space as long as it is not in a clearway. Loading Bays are ACTIVE, so stay out of them. Time limited bicycle lanes are also ACTIVE. Basic rule: If it says anywhere you are not allowed to do something on a Monday, then the Bank Holiday doesn’t change the weekday!! It is still a Monday! A Food & Craft Market will take place in the Farmyard at Farmleigh House and the Drogheda Brass Band will play in the Bandstand from 14:00-16:00. 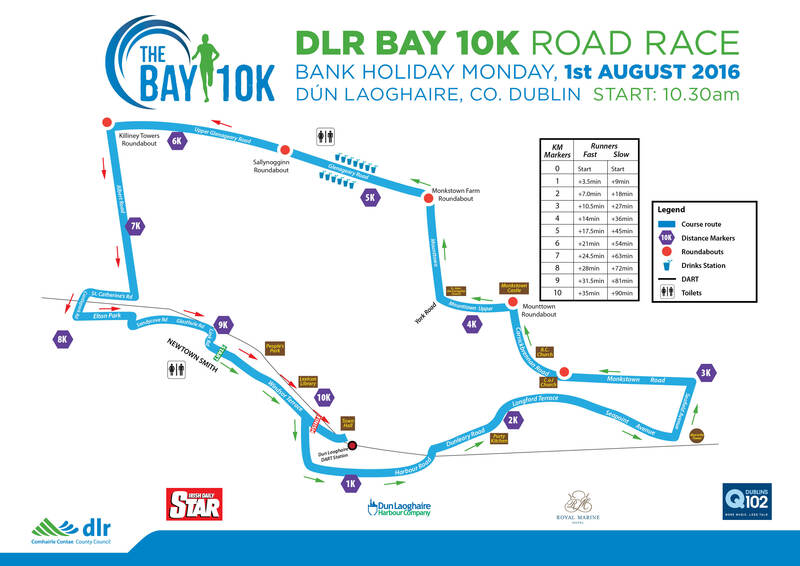 2500 runners will embark on a 10km run on the Bank Holiday Monday. Participation is not free, but cheering them on is free. The race will start at Newtownsmith Green (between Dun Laoghaire Pier and Sandycove) and will finish between the LexIcon Library and Dun Laoghaire DART Station. The route is Newtownsmith, Windsor Terrace, Queen’s Road, Crofton Road, Harbour Road, Dun Leary Road, Longford Terrace, Seapoint Ave, Seafield Ave, Monkstown Rd, Carrickbrennan Rd, Mounttown Upper, Mounttown Lower, Upper Glenageary Rd, Albert Road Upper, Albert Rd, St. Catherine’s Rd, Castle Park Rd, Elton Park, Sandycove Rd, Glasthule Rd, and Link Rd. A map is here. The Dalkey Vintage Festival will bring you vintage & classic cars, bikes, scooters and trams. It will take place on Monday and admission is free. In addition there will be food, music, stalls and vintage clothes. Music Together will perform songs composed and arranged by their students on Monday. A Drop-in drawing session will take place on Monday. The theme is “Drawing a Figure”. Suitable for adults and teens. All materials will be provided. Admission is free – for the first 25 participants. The Tiny Quartet are playing instrumental Jazz/Pop Covers at this gig in the Harbour Bar. This is a family workshop at Saint Patrick’s Cathedral for parents with kids aged 8+. Follow in the footsteps of medieval monks and learn how to make an illuminated letter inspired by the Book of Kells using caligraphy and painting techniques. Admission is free, but a contribution for materials of EUR 7 is raised. But I have great news for you: if you use the exclusive Discount Code “eventguide” (without the “”) when you buy your tickets, the EUR 7 will be waived!! There will be two workshops on Tuesday. The first one begins at 11:00 and the second one at 14:30. The workshop will take place in the Cathedral’s Discovery Space, located in the south transept (formerly the Chapter House). Paul McCotter talks about “Territory, Maps and Genealogy” at this “Genealogy at Lunchtime” talk. Over 62% of B2B buyers respond to salespeople that connect with relevant insights and opportunities. Leading ICT companies are embraching social selling as a means to initiate and build trusted relationships between their sales teams and high value prospects. Combining personal branding and content marketing, social selling can help sales teams outperform peers and competitors in pipeline development and surpassing targets. This seminar will introduce attendees to the basic concepts of social selling and summarise best practice techniques for social selling on LinkedIn. The seminar will be presented by Rosemary Clancy, Social Media Sales Program Manager at Oracle Direct EMEA. At this month’s event there won’t be a talk, instead it is just meet up for a chat among like-minded people. The talks at the monthly meeting will resume again next month. Meet up on the top floor of J.W. Sweetman’s. Doors open at 18:30. Admission is free. Pleasing Features Music will present “Pine the Pilcrow” with support from Ger Kelly, “Jazzotopes”, Oran Reilly. It will be an acoustic session on the Vintage Room. In the past Kilmainham Gaol (the most popular site) and Rathfarnham Castle were also on that list, but I was explicitly told that they both have been removed, which is a big big loss!! Oddly, the Free Wednesday document on the Heritage Ireland website site at www.heritageireland.com now suddenly mentions the Kilmainham Gaol again, but the page www.heritageireland.ie/en/dublin/kilmainhamgaol/ , which is part of the same website says “Please note Free Wednesday does not apply to Kilmainham Gaol.” And if you go to www.heritageireland.ie (note the .ie instead of .com) the “Free Wednesday” document on the right, appears as “FREE Wednesday – Updated Mar 2016” and it excludes Kilmainham Gaol. Confusion everywhere! I will call them again on Tuesday and will update you via the Dublin Event Guide Facebook Page, but sadly I think we have to assume that Free Wednesday will NOT be restored for Kilmainham Gaol. “During this programme, very young children and their families will be led through a space which looks at and explores the environment where both we and other creatures live. Using simple props such as a little cardboard house and work stations,children will be enabled to fluidly explore creative themes and ideas, such as webs, nests, houses and burrows and be encouraged to visually create their own version of home. Suitable for children 3-5 years and their parents. The event will take place at 10:30 and again at 12:00. Admission is free, but booking is required via 01-6269324. Do all whales have teeth? What is a turtle’s shell made of? Drop by the Discovery Zone today to learn about creatures under the sea and smell a stinky pilot whale skull. Admission is free and no booking required for this Drop-in activity. Suitable for families. Artist Damien Flood will discuss his work and his exhibition “Terra incognita” with Mary Conlon, Artistic Director at Ormston House, Limerick. The Salon Series is a free monthly talk series that showcases the creative community of The Liquor Rooms. This month, the topic is “Coding” and speakers will be Vicky Twomey-Lee, Mick Twomey and Irina Dzhambazova. + Thursday 04 August in Sin E.
Admission is free and to get guaranteed access, you can book tickets via the Eventbrite links above. But even if you don’t get a ticket, it seems that queueing at the venue is a good idea. Admission is free, but booking is required via 01-8344906. Archaeologist Antoine Giacometti takes you along the ancient road into Dublin “An Sligh Mor” and will tell you about some of the treasures uncovered in a 2014 dig. James’s Street and Thomas Street form part of this ancient western road into Dublin, called An Slígh Mór. These streets are also among the city’s oldest thoroughfares and have been the commercial heart of The Liberties for centuries. Recent archaeological discoveries unearthed as part of streetworks in 2014 have revealed a fascinating hidden history to the street. From the remains of a late medieval gate, to 17th century city defences, to artefacts from a possible tilery off Crocker’s Lane and even human remains near St. Catherine’s Church, this walk will offer you a window to past life of these streets. This is a free event provided as part of Summer in The Liberties, but booking is required via the Eventbrite site below. Meeting point is the Obelisk Fountain in James Street, Dublin 8. At the children’s workshop “Introduction to Archaeology”, learn to investigate and explore the past through creative and practical activities, including a mini-dig. These fun and educational workshops are free and are hosted by The School of Irish Archaeology in various libraries in July and August. Booking is essential as places are limited. To book, contact the library that runs the event you are interested and a link to their contact details is provided on the website below. Fiona Fitzsimons talks about “Explorations in Irish genealogy” at this lunchtime lecture. August is the month for the yearly “Opera in the Open” at the Amphitheatre behind Dublin City Offices and not far from Christ Church Cathedral. Every Thursday a different Opera will be featured for you to enjoy. Bring your picnic/lunch and enjoy some music. Kings of Ancient Egypt, known as Pharaohs, liked to have their names displayed in an oval shape known as a cartouche. Drop by the Learning Resource Room to write like an Egyptian and create your own royal cartouche to take home. Admission is free and no booking required. The drop-in activity is happening in the Learning Resource Room, first floor. Come to this tour of the exhibition “Yeats: The Life and Works of William Butler Yeats” on Thursday. The tour will introduce the life and work of the poet and after the tour you will have a chance to listen to a selection of voices speaking some of his best loved poems, including “Easter 1916”. Admission is free and ooking is not required, but places are limited. “Soldiers, Spies & Scars: Dublin Castle and Revolutionary Ireland” is a guided evening tour in Dublin Castle. The event is also listed on the Eventbrite page here, but I am not sure if registering via Eventbrite is better than via e-mail. Do you remember “Shakespeare in the Park”? The great team at Fortune’s Fool Production originally started in Ranelagh Gardens, then they moved to Iveagh Gardens and this year all their work has been recognised and they went on a nationwide tour first and now are back in Dublin for what I would cheekily call, the main event. The Gardens of Dublin Castle (near Chester Beatty Library) is the location this year and because of the different locations chosen, the event was renamed to “Shakespeare at Irish Monuments”. The play is “Measure for Measure”, a lesser known play by Shakespeare, so to prepare yourself, have a read of the story behind the play here. Admission is free and no booking is required. Chairs are not provided, so bring a blanket or similar. There will be no roof and the play will go ahead in light rain, but could be cancelled in heavy rain. Check the Facebook Page below for any updates. Rock ‘n’ Roll band “The New 52” are playing a gig in the Harbour Bar. “Ireland: The Tear and The Smile – Part 1” was intended to provide an accurate picture of everyday life in Ireland in 1960 for American television audiences. After it was broadcast in 1961, Irish diplomates in the US criticised the film as presenting Ireland as a “poverty- stricken country riddled with backwardness, unemployment and emigration”. Were they right, or did they just not like the facts to be shown? The film was directed by Willard Van Dyke, is 27 minutes long and will be presented in collaboration with the Irish Film Institute. A Garden Walking Tour with Christopher Heavey will take place at Farmleigh House. Admission is free. Meeting Point is the Walled Garden behind the house. A drop-in drawing session for adults and teens will take place on Friday. The theme is “Portraits”. All materials will be provided. Admission is free – for the first 25 people. The Dame Distric Rock ‘n’ Roll Festival is back from Friday 05 – Sunday 07 August. There will be lots of Rock ‘n’ Roll music and also a Vintage Car Show. a dance competition and a celebration of 50s/60s Rockabilly styles. There are a few different websites that still point to last year’s programme or have some other inconsistent information on them, so make sure you get the official story and the Facebook Page below is the best place for it. The Reggulators will play Reggae at this gig in the Harbour Bar. Bands Checkpoint and Identity Thief will play a gig at midnight in Whelan’s. Admission is free if you arrive before 22:30 or if you sign up for the guest list via the website below. Dublin is never boring and Dublin City regularly gets into hot water and often enough screws up big time. Something emerged again last week that had “Big Screw-up” written all over it, but is it that? Supporters see it as a clause protecting life, but the flip side is that it makes abortion illegal by constitution. Now, abortion was always illegal based on Irish laws and that amendment wouldn’t have been needed, but the anti-abortion campaigners were worried back then that the other laws wouldn’t be strong enough. At the time 67% of the voters in a referendum were in favour of this amendment. Many people’s views about abortion have changed, however in the last 33 years and these changed views do support the availability of abortion in Ireland either in a restricted number of situations/scenarios or in every situation. And since the Irish laws haven’t prevented abortions, but made it extremely difficult and emotionally stressful for women in Ireland to get an abortion by travelling to other countries, these laws are useless anyway. Since 1981, the “Repeal the 8th” campaign has grown and become stronger and the website “The HunReal Issues”, which promotes women’s issues, has commissioned street artist Maser to create this mural in Temple Bar. Dublin City received 50 complaints and then told the Project Arts Centre that they will have to remove the mural because it is against planning legislation. But it seems that legal situation is not crystal clear. The Journal.ie writes “A spokesperson for Dublin City Council said that class 12 of schedule two in part one of the Planning and Development Regulations 2001 “exempts the painting of the external part of any building or other structure from requiring planning permission”.” So that means you do NOT have to ask for permission to paint the external part of a building, right? But then the Dublin City folks continued saying “Murals and other artistic designs require planning permission when applied to the external part of any structure.” I might be missing something here and maybe the key is in “painting” vs “mural”, but JUST with that information I can’t see how the law was broken. What got me at first was that the Project Arts Centre said that they never experienced any planning legislation issues despite the fact that they regularly have murals on the side of the building. If a abortion related mural was treated differently by Dublin City than other murals, that would certainly not be ok.
What if Dublin City didn’t get any complaints for previous paintings? If they don’t get active UNLESS they get complaints, then the current situation is not censorship. – What if previous murals didn’t contain a political (or commercial) message but were just pieces of art? Then it would be more about an “ad” vs a pretty picture. – And how would I feel if someone put a big promotion on a building of an idea I was opposed to? Anti-abortion murals on house walls maybe? How tolerant would we then be? And taking all this into consideration, I can see why this specific mural is different than someone painting a pretty flower pot on the side of a building. The mural is the expression of a free opinion and the expression of opinions has to be protected by our laws, but there are MANY ways to express an opinion and not every way has to be allowed. So, I would have a serious problem if it was made illegal to express “Repeal the 8th”, but I don’t think if one path of expression was declared as not permitted.